Product prices and availability are accurate as of 2019-04-20 09:09:38 UTC and are subject to change. Any price and availability information displayed on http://www.amazon.com/ at the time of purchase will apply to the purchase of this product. Overview? SDG800 Series Function/Arbitrary Waveform Generator is equipped with maximum output frequency of 5 MHZ, 10 MHZ, 30 MHZ, and 125 MSa/s sampling rate. With the new innovated easy Pulse technology, SDG800 can generate pulse of low jitter, quick rising/falling edge regardless of frequency effect, while the duty cycle, edge and pulse width could be widely and accurately adjusted. SDG800 is much superior in performance to similar DDS signal generator. Main Features: ? Advanced DDS technology, 125 MSa/s sampling rate, 14 bit vertical resolution ? Single channel output, 5 kinds of standard waveforms, built-in 46 kinds of arbitrary waveforms (including DC) ? Complete modulation functions: AM, DSB-AM, FM, PM, FSK, ASK, PWM, linear/logarithmic sweep and burst ? Innovative easy Pulse technology, can output pulse of low jitter, quick rising/falling edge ? Standard interfaces: USB Device, USB Host, support U-Disk storage and software update ? Provide 10 nonvolatile storage spaces for user’s arbitrary waveforms ? 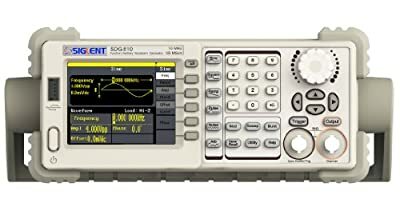 Be capable of seamlessly connected to SIGLENT digital storage oscilloscope ? Configurable with powerful arbitrary waveform editing software easy wave.